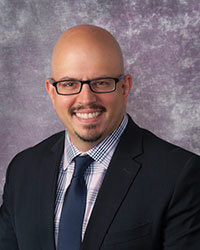 Dr. Risbano is the Director of the Invasive Cardiopulmonary Exercise Program and the Head of Clinical Operations for Pulmonary Hypertension in the Division of Pulmonary, Allergy and Critical Care Medicine at the University of Pittsburgh. He directs the exercise component of the clinical and research right heart catheterization efforts at the University of Pittsburgh. Dr. Risbano utilizes invasive cardiopulmonary exercise testing (simultaneous upright bicycle, gas exchange, radial artery line and pulmonary artery catheterization) to study our patients/subjects with dyspnea on exertion. Exercise pulmonary hypertension (ePH) falls on a continuum between health and overt pulmonary hypertension. Dr. Risbano is interested in identifying patients with early pulmonary vascular disease utilizing exercise right heart catheterizations and is currently evaluating different diagnostic and treatment modalities for ePH. Dr. Risbano is an attending physician in the Comprehensive Pulmonary Hypertension Program. He works with patients with all forms of pulmonary hypertension. Dr. Risbano performs right heart catheterizations to diagnose and follow the hemodynamic progression of patients with pulmonary hypertension. He is also attending Intensivist physician at Shadyside-UPMC. Wallace WD, Nouraie M, Chan SY, Risbano MG. Treatment of exercise pulmonary hypertension improves pulmonary vascular distensibility. Pulm Circ. 2018; Jul-Sep;8(3): 2045894018787381. Rivera-Lebron B.N., Risbano M.G. (Senior Author). Ambrisentan: a review of its use in pulmonary arterial hypertension. Therapeutic Advances in Respiratory Disease. 2017; 11(6): 233-244. Risbano MG, Kanias T, Triulzi D, Donadee C, Barge S, Badlam J, Jain S, Belanger AM, Kim-Shapiro DB, Gladwin MT. Effects of Aged Stored Autologous Red Blood Cells on Human Endothelial Function. Am J Respir Crit Care Med. 2015; 192(10): 1223-33. Hunt JM, Risbano MG, Messenger JC, Carroll J, Badesch D, Lowes BD, Casserly IP, Kay J, Bull TM. Timed response to inhaled nitric oxide in pulmonary hypertension. Pulm Circ. 2014; Mar;4(1): 103-9. Risbano MG, Gladwin MT. Therapeutics targeting of dysregulated redox equilibrium and endothelial dysfunction. Handb Exp Pharmacol. 2013; 218: 315-49. Kapnadak SG, Abt D, Risbano MG. Acute respiratory failure mimicking acute respiratory distress syndrome due to parenchymal infiltration by metastatic melanoma. Pulm Circ. 2013; Dec;3(4): 959-62. Stamm JA, Risbano MG, Mathier MA. Overview of current therapeutic approaches for pulmonary hypertension. Pulm Circ. 2011; 1(2): 138-59. Meadows CA, Risbano MG, Zhang L, Geraci MW, Tuder RM, Collier DH, Bull TM. Increased expression of growth differentiation factor-15 in systemic sclerosis-associated pulmonary arterial hypertension. Chest. 2011; May;139(5): 994-1002. Risbano MG, Meadows CA, Coldren CD, Jenkins TJ, Edwards MG, Collier D, Huber W, Mack DG, Fontenot AP, Geraci MW, Bull TM. Altered immune phenotype in peripheral blood cells of patients with scleroderma-associated pulmonary hypertension. Clin Transl Sci. 2010; Oct;3(5): 210-8. Risbano MG, Groshong SD, Schwarz MI. Lung nodules in a woman with a history of breast cancer. Diagnosis: a sarcoid-like reaction in metastatic breast cancer. Chest. 2007; Nov;132(5): 1697-701.